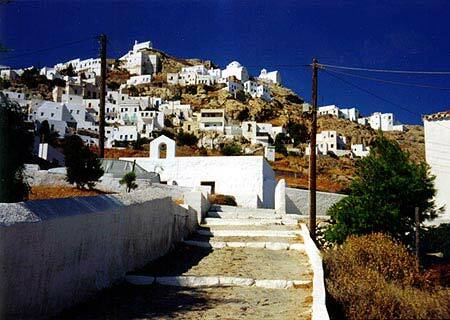 The Chora of Serifos is one of the most beautiful villages in the Cyclades. Located 5 km from the port and the tourist activity of the island, it is a paradise for those who seek peace and serenity. Each of us lives here in our own carefree rhythm. 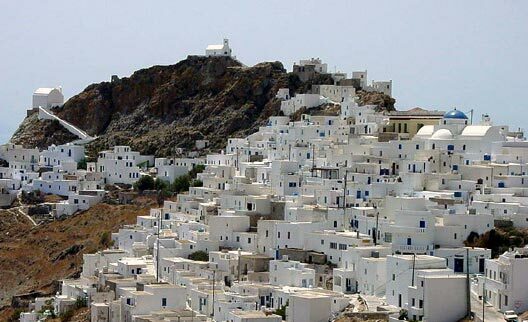 The bravest visitors to Chora will take the steps from the port of Livadi, a 40 minute climb. 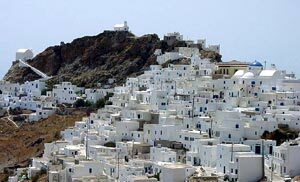 But a 20-minute bus ride will deliver you to the shopping and social center of Chora. The steps to the village Here you will find the main restaurants (Plakes, Petros), 3 cafes (Oi Myloi, Karavomilo, Vassileas ), 2 groceries and a pastry shop. The environment is friendly, though the main road can be a distraction to the beauty of the village. From here, begin your visit to the village by walking toward Castro along the pathway next to Chalidas grocery. 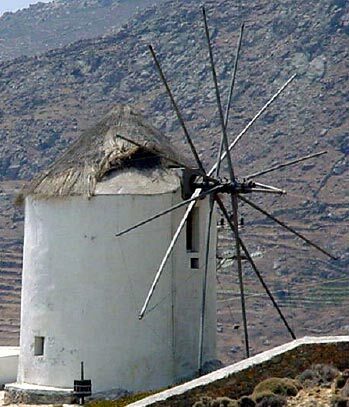 The way is marked by small shops: A bakery, only one of two in the Cyclades that still stoke the oven with wood, a shoe maker where shoes are hand-made to order, and gift shops featuring local products and souvenirs. The steps continue to the top of Castro - the climb may seem difficult but visitors are rewarded by the spectacular view from the top chapels. 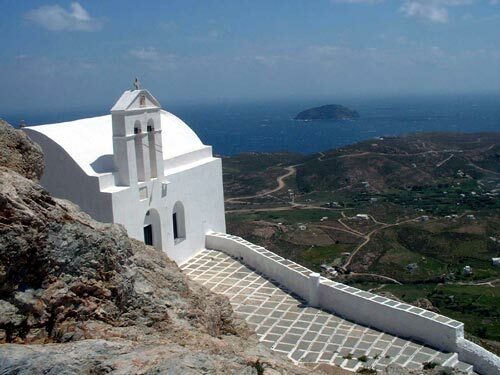 The sight is amazing - the wild landscape and coasts of the island, the beaches and Aegean beyond. The top chapel, St. Constantine, dominates the top of the village, fixed on the rocky point, quietly contemplating the neighboring islands. The church Evangelistrias Taking the pathway around the hill and on the other side of the village, you will arrive in St. Athanasios square, the perfect place to stop for a refreshment. 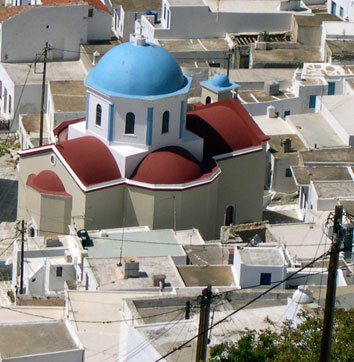 Don't forget to visit "lower Chora" where the red tile roof and blue dome of the church of Evangelistrias are easily visible. Charming houses and panoramic views will greet you. From here, you can continue your descent to the port of Livadi. 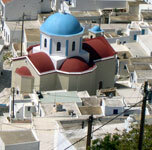 But, an evening under the stars in Chora is magnificent and not to be missed!